I have been a knitter my whole life, and a spinner for over 20 years. My passion for fiber led me to teaching, and working in a retail yarn shop for over a decade. I love education, opening the door to beginners, or expanding the horizons of more experienced fiber people. In my classes and events, I’ve found the kindred spirit between fiber friends, whether knitters, spinners, hand-dyers or fiber producers, is creatively uplifting and inspiring. I have taught students from children to seniors, and always find the same joy and encouragement when “Fibernating” in all age groups. There is a tangible feeling of connection and community when knitters and spinners are together, and my goal is to encourage more students, and create more opportunities for gathering to share this powerful creative energy. I am an independent fiber arts instructor, and love sharing my knowledge and experience with others. I have created a line of patterns that originally were intended for hand spinners and their handspun yarn, but have expanded to highlight small fiber producer’s yarns and fiber. I am a dealer for Majacraft spinning wheels, the original double treadle wheel from New Zealand. I have spun on a Rose spinning wheel since it was first developed, and it is still my wheel of choice. Living in our technologically saturated world, it has become ever more important for us to come out of the “virtual” world, and reach into a “tactile” one. People who don’t knit or spin, are drawn to the colors, textures and process of fiber arts. 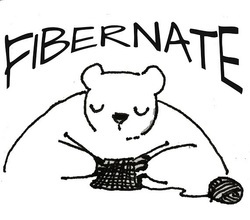 You can’t knit or spin in public without someone asking you “what are you making?” or even more amazing “what are you doing?” I say Fibernating. When I teach students how to drop spin they are incredulous at their own ability to make yarn in just a few minutes of instruction. “It’s like magic” they say, and I agree. I’ve had students who leave a beginning knitting class saying, “it’s something they were missing, and didn’t even realize it until they learned how.” It’s not really magic, it’s been in our genes for centuries, and we just have to rediscover it.